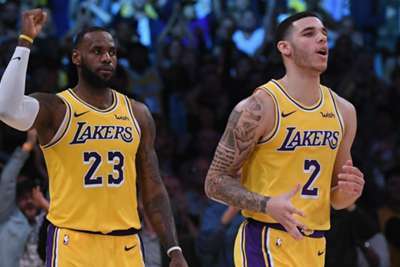 Los Angeles Lakers superstar LeBron James and team-mate Lonzo Ball revelled in their triple-double feat, though the pair were just happy to avoid back-to-back NBA losses. James and Ball became the first Lakers team-mates to post triple-doubles in the same NBA game since 1982 after Los Angeles outclassed the Charlotte Hornets 128-100 on Saturday. Not since Magic Johnson and Kareem Abdul-Jabbar 36 years ago had a pair of Lakers team-mates achieved the feat, while Jason Kidd and Vince Carter were the last team-mates in the NBA to reach double-digits for points, assists and rebounds in 2007. James had 24 points, 12 rebounds and 11 assists for his 75th career triple-double, and Ball tallied 16 points, 10 assists and 10 rebounds as the Lakers bounced back from Thursday's defeat to the Houston Rockets. "Elite company," James – who sat out the fourth quarter – told Spectum SportsNet. "We just tried to do a little bit of everything to help our team win. Try to put the ball in the hole, rebound so we can start the break then get our guys involved. "That's the most important for us. It's a great feeling when you're able to make a pass to a team-mate and see them make a shot. "We pride ourselves on not losing two in a row," added James. "We had a tough one in Houston." On the performance and playing alongside four-time MVP James, Ball said: "It's a dream come true. I grew up watching him my whole life. "He is my favourite player of all time. To be out here getting wins with him and go in to battle with him, it's great."